seems to have run its course and to be having the effect on certain blogees that installations of dismembered dolls, pubic hair and the top off an old babies’ bottle has on me. So instead of a rectangle here is a picture of Dylan clearing the water jump even in spite of the restrictions imposed by the silly coat he’s been made to wear. This entry was posted in Along Came Dylan, Fetching Dylan, Walking Ollie and tagged Along Came Dylan, Salukis, winter. Bookmark the permalink. Having spent a while this morning trying to capture a photo of Rudi in the white stuff (and his mac), I can truly appreciate this snap! Dylan looks as if he is taking part in a Royal Marines training exercise. 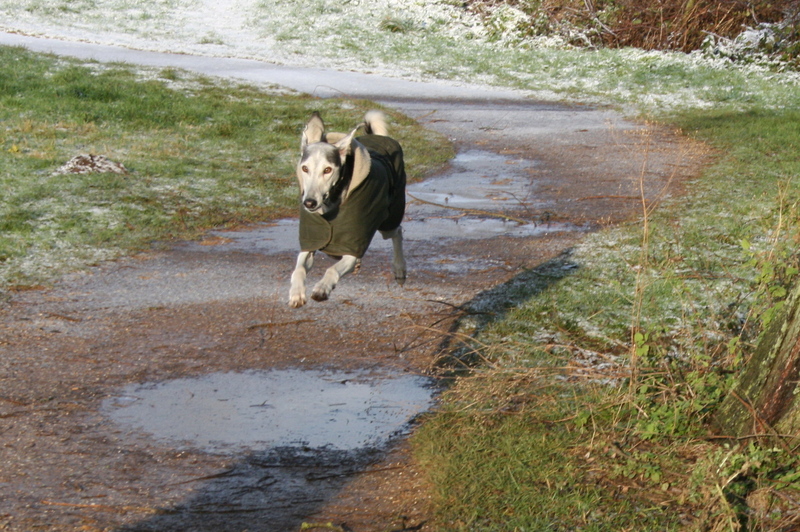 Those ears act as wings – not leaping so much as taking off! Oh….there’s my boy! I’ve missed him these past several days. He looks handsome in the coat, and green is definitely his color. Drzl hates her coat and spend half her time outside trying to rip it off. But it is below 0 with the windchill factor, so no coat….no outside running. My friend has a tiny dachshound who “had” a little coat for running about in the snow. But their German Shepherd who was playing with the dachshound, stared at the coat and then ripped it right off. He ran away with it, and to this day they have not been able to locate it. What does go through their heads???? All dogs by religion are naturists and the imposition of coats, by their human oppressors, disgusts all other dogs. The Gernan Shepherd the ‘Soldiers’ of the species have a duty to rip these signs of oppression off at any given opportunity and destroy them. Oliie still manages to run and jump with his coat on but when I first strap it round him he acts like he’s got a baboon on his back!! Gee, I’ll have to put Drzl’s coat near the woodstove before she goes out. Maybe that will help. We’re in the process of purchasing her a “dog cave” to sleep in now…..the interior is completely lined in sheepskin. She seems to get very cold at night, and manages to slither her way from the foot of the bed up to the pillows. We like to sleep in a cool house, but she apparently does not….hence, the dog cave. 🙂 And a Very Merry Christmas and Prosperous and Happy New Year to all you dear people!!! Stephen, if I may ask, does Dylan’s lovely coat cover his belly? My husband feels the dogs are still cold because the coats only cover their backs. Do you know of any reason why they’re made with the bellies still uncovered?? Thanks! Merry Christmas & all the best for the New Year to you and yours, Patty.